I do have sympathy for the guy in the Post Office because I think of my 87 year old mother. Anyway...she has no computer and she doesn't really quite get the idea of the internet or how to use a computer. She is starting to get perturbed as she will call some place for something or other and they want her to get it online and she has no online. Having a computer at the library, for example, wouldn't help as she has no idea how to get online and would be hopelessly confused by it. It's certainly true that you don't have to be elderly to be a technophobe. DW's brother, same age as me, owns and runs a retail business. It's a one-man operation, but he's been operating it for decades. He has always refused any involvement with computers, and does all his business on his office typewriter. He won a speed typing contest in high school, and I guess the pride/nostalgia is just too great for him to give it up. He needs an email address for his business, so he has one that a friend set up. Once or twice a month, the friend prints out his emails and drops them off at his store for him, so he can answer them with either a phone call or a typed letter. I've offered many times to set up and teach him how to do everything on a computer (I spent years as a technical writer/website designer), but he has always refused. His idea of being "with it" is his creative use of different colors of typewriter ribbons. What mystifies me is that not only is he intelligent, but actually extremely intelligent. He just doesn't like modern life, and has often spoken wistfully about how wonderful it would be to live in the 19th century. You used punched cards? You had it made! See this. Political Calculations: When Will You Become Obsolete? This does not look promising. According to that site I'll be technologically brain-dead in 11 years. The thread reminds me of one of the secretaries Administrative Aides in our office ~1995. She used a desktop running MS DOS 4.4 and WordPerfect, connected to a noisy dot-matrix printer and therefore associated a computer with work and a noisy printer. Then she found out she could get E-mail and pictures from her grandchildren in Oregon on the other side of the country. Well, that changed things. Then she wanted it on her side of the bed. My 86 YO Mom Skype's, I couldn't figure out how to do it. There's this joke widely circulating on the internet and through emails. So, I searched this forum, and sure enough someone has posted it here. DW's brother, same age as me, owns and runs a retail business. It's a one-man operation, but he's been operating it for decades. He has always refused any involvement with computers, and does all his business on his office typewriter. We have a family member like this, but we're convinced the reason the business is not on the computer has more to do with records of cash flow (wink wink) than philosophy. OK, I'll play the game. My introduction to programming was on one of these things. You could program it (and you had to boot it this way) by flipping those little lever switches (making words in octal). 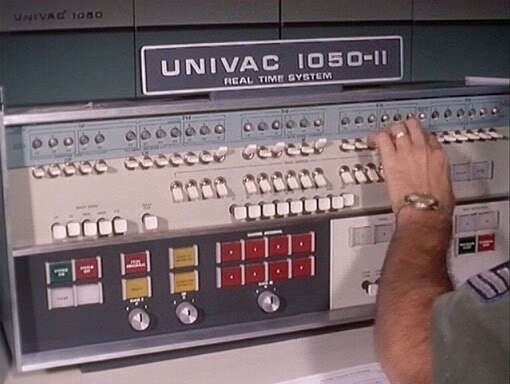 Of course we also used punch cards and magnetic tape, but this was the original "machine language." The peripherals (punch card sorter, interpreter, etc.) were programmed with plug-in wiring boards, as shown by rescue me. Memory wasn't on disks, but drums. Think "3-foot lengths of sewer pipe with a magnetic coating and 64 read-write heads." Ah, those were the days! I don't miss 'em a bit. At which point I'll almost certainly be on my second or third body, and I'll probably just update my technological capabilities with the new MindDesign options for the season. "MindDesign: You CAN change your mind!" I wonder what our kids are going to be dragging us into, in the future. Our kids are already affecting us. They like texting, facebook and iPads for each of their kids. I refuse to pay extra for texting on our cell. To me it's like going back to BBS time. Why type (and pay) instead of talking for free? We found a way to comply, we use Google voice, which includes texting for free. There is no choice, but to sign up for facebook, or forget about getting any updates or pictures from our kids. iPads are here to stay and I refuse to help DD with setup. iCrap is not for me, but grand kids love the games - anything electronic is a hit. Can't imagine a toy that is silent when squeezed in the right place. It would be sent back into the box as broken. Times are changing.. it's more then just inflation we have to keep up with! Hard to say what it was, when it isn't. I refuse to pay extra for texting on our cell. Me too. But it costs less to text than voice on my simple no-contract phone in that texts cost me 0.25 or 0.50 minutes each vs 1 minute increments for voice. That's why I'd rather text and often can (short messages). I think the days of paying extra for texts are fading fast if you look at the contracts available now. Fortunately, I do not trade often in my IRAs, and do my regular activity on Ameritrade's platform. I also trade with TD Ameritrade! Vanguard is only OK with MF. I hope they will improve with time, they have free ETF trades after all. Technology is great but it does have its costs. NY Times series on manufacturing in China, focusing on factories which churn out Apple products, gives you a picture of what we've traded for these electronic conveniences. The demand for better products every year -- sales keep going up -- drives harsh working conditions in these factories, kind of like the modern sweat shops. Then there are the ecological costs, especially when people are encouraged to traded up their gadgets every year or every other year for improvements, even though the devices they have function fine. So not only increasing volumes of resources used to build more devices but a lot of energy to recycle and dispose of devices which have been traded in or dumped.